Canadian Artist Dave Goodman is a musical chameleon. The youngest of seven, born and raised in Victoria B.C. in a household where music was always played and sung he began with electric guitar, with Blues and Rock at the age of twelve. His first great influence was Blues guitarist Dave Vidal . In his teens Goodman became more and more interested in Jazz. At seventeen he was selected as “Top Highschool Jazz Guitarist” in British Columbia and was invited to play in Canadian Jazz legend, Phil Nimmon's Honour Jazz Ensemble, after which he studied music at Vancouver College. After many years on the road in both Canada and the USA at the end of the 90s, Dave Goodman moved to Bremen, Germany where he still lives. The move to Europe inspired a new direction towards being a singer-songwriter. At the same time he began to apply his phenomenal finger dexterity and technique to the acoustic guitar. In his multifaceted music his early influences are present as well as the deeper roots of Anglo-American and Irish-Celtic music inherited through the genes of his parents. This wide range of influences and musical colours makes categorizing his music nearly impossible. At the same time, as an artist he is distinctive and unique. Goodman’s impressive voice can go from a sensitive timbre in ballads to a rough and raw tone in bluesier pieces. His songs are mostly personal and reflect the pictures of his life and travels. Dave Goodman tours regularly Europe-wide and in North America. He performs mostly solo and has played as support for Peter Maffay and Joan Armatrading among many others. He also performs in duo and trio formation. Goodman is often invited to guitar festivals in Europe and Asia and gives workshops regularly in Italy, France and Germany. 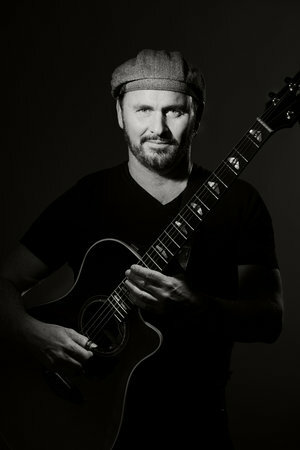 Onstage Dave Goodman is a musician’s musician, a storyteller and entertainer, a world class virtuoso guitarist with a great voice and great songs. Full of stories, humour and with a personal touch, he always connects with his audience and makes every concert an experience to remember.